Some of the most overlooked and neglected components of concrete features in outdoor areas are coping stones. These unassuming components actually play a big role in keeping outdoor structures safe, attractive, and functional. Coping stones are used to cap free standing walls. They protect the wall from weather damage as well as giving an aesthetically pleasing finish. Caps and coping primarily act as protection against the damaging effects of constant exposure to the sun, rain, snow, and ice. They also adorn features such as pools and help prevent injuries caused by blunt pool edges. Coping stones give extra appeal and add strength and durability to your hardscapes – adding years of use and protecting your investment. They are available in dozens of designs, shapes and sizes that allow for easy customization by matching your property’s existing overall theme for a truly harmonious look. At Lane’s Landscaping Supplies we carry top quality caps for all your design needs including sandstone, concrete, bricks, limestone, marble, granite, bluestone and slate. They come in various color options and textures. With skillful design and installation of wall caps and coping, it’s possible to combine form and function for a truly stand-out property. Because they come in various colour options and textures, the possibilities are endless. Our range boasts a wide collection to recreate a classical feel to your property. We also carry more contemporary looks from elaborate decorative products to more refined sleeker coping stones for that modern design. 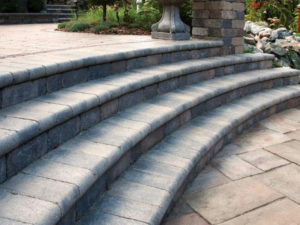 Lane’s Landscaping Supplies carries quality caps and coping products that perform a vital protective role for your investment and are designed to perfectly match your property in the most stylish and effective manner. Get inspired and take a look at our other products or contact us today to complete your landscaping design with our range of unique coping stone products.